How Much Insurance Do Big Trucks Carry? How Much Insurance Do Trucking Companies Have? Prior to 1980, if you can believe it, the required insurance limits were $100,000 per accident, $300,000 per occurrence, and $50,000 for property damage. To better protect motorists, the federal government now requires that any carriers (generally tractor-trailer shipping companies) involved in interstate commerce and registered with the Department of Transportation must have some insurance. Specifically, the government requires an MCS-90 (Motor Carrier Safety-90) endorsement to pay out in case of injury or death caused by carrier’s shipping activities. Because the MCS-90 is mandated by federal law, it exists in every carrier’s insurance policy regardless of whether it’s in the written terms or not. If you are injuring a truck that should be is covered by MCS-90, you have a policy that conforms even if the language of the policy contains different law. Maryland does a lot of the same thing, rewriting insurance policies with mandatory statutory language and coverage. MCS-90 requires the insurance company to attempt to cover the victim’s damages anyway, usually up to a minimum of $750,000. This guarantees that victims of at-fault negligent carriers will be able to recover some of their damages. It is a safety net - just a small one in some cases - designed to protect innocent victims from nonresponsive carrier insurers. There are three ways -- bond, insurance, or self-insurance -- trucking companies can use to meet the financial responsibility requirements. However, there are several restrictions on the MCS-90. For example, the truck involved in the accident must be working for a “for hire” motor carrier. “For hire” means that the drivers are being paid by another to transport goods, and this evaluation is made on a truck by truck basis. Sometimes, courts must examine the very nature of a business to see if it’s “for hire.” Additionally, the truck had to have been acting in interstate commerce. What exactly interstate commerce is can be a murky and convoluted issue, but it is again controlled by federal law. And finally, often suing the driver is not enough. Some MCS-90 provisions will only pay out only if the award is against the carrier as opposed to the driver. Accidents involving commercial trucking vehicles can be very costly. For instance, a 2012 jury in Maryland awarded a nearly $8 million verdict for a catastrophic tractor-truck crash that severely injured a fellow driver. While $750,000 is a nice guarantee for American drivers in most cases, it does not protect against anything resembling the full risks involved in truck accident cases. Of course, you have to remember that many trucking companies have a lot of assets. If you are in a crash with a big company like FedEx, Roadway Express, YRC Freight, Schneider National, JB Hunt Transport, UPS or another company with a huge fleet and billions in assets, the point of how much coverage the trucking company has is academic. But there too many fly-by-night companies. It is also important to look for other possible defendants like the broker or the shipper if you are running up against coverage issues. Our firm has a lot of experience dealing with getting to the broker and the shipper in truck accident cases. Remember, there is another path to finding insurance coverage beyond the insurance policy limits. 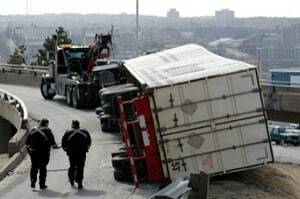 The broker and shipper may also have liability in a truck accident case. This can quickly turn a $1 million case into a $5 million case. Sometimes, the most challenging issue in a truck accident case is sorting out the insurance issues. We can sort them out. One of our lawyers is an insurance law professor, and our firm has a tight handle on these issues. Whether you are a victim or a referring lawyer, if you need help with your case, call 800-553-8082 or get a free online consultation. Why these trucks are so dangerous... and why it matters when putting a case together.